My grandparents on my mother and father’s side were both born in China. During Mao Ze Dong’s Communist Revolution (CCP) in 1947, both sides had to flee the country. Many fled to Taiwan in fear of being tortured or even worse, persecuted if they stayed in China. Once situated in Taiwan, the country gave them new opportunities to prosper in business, jobs, creative freedom and better education for their offsprings. 35 years ago, after graduating college, my parents (who hadn’t met at the time) decided to move to America for better job opportunities. The “San Gabriel Valley” in Los Angeles County is where they each landed along with their siblings and parents. Since then, my dad has gone back maybe 2-3 times in the earlier years, but have not gone back in over 20 years. While he isn’t much of an avid traveler like his 2 daughters, I could tell that he needed to go back to see the place where he was born and spent the first 30 years of his life. 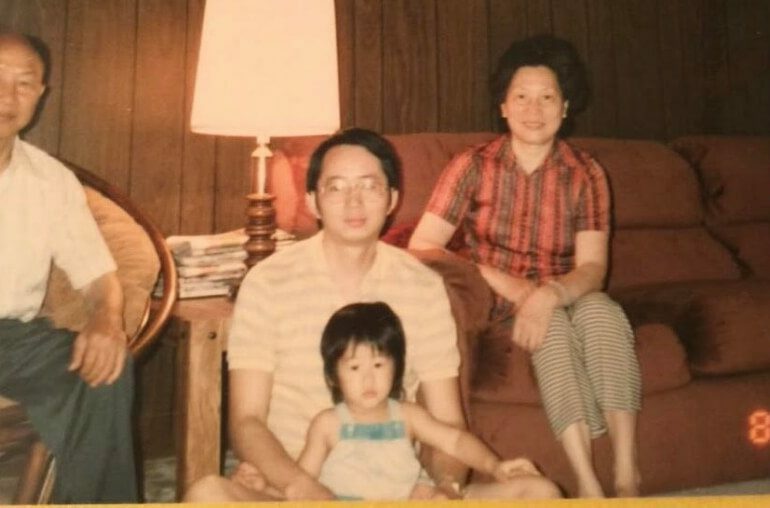 Me at the age of 2 or so with my Dad & Grandparents in our first home in Rosemead, California. For the past 2 years, my sister and I have asked if he wanted to go back to Taiwan for a visit. He said he didn’t care to go back, nor did he miss it and would rather explore China or Japan more. Or Europe. While there is no bad blood or memories from his motherland as other immigrants may have had when they left their home country (due to war or other traumatizing events), my dad had nothing but good memories. We came to conclusion that he just didn’t realize he missed the place, so this year, my sister and I decided to just buy his flight ticket and say “Hey! we’re going”. It felt good to finally be able to give back to our dad who has wholeheartedly supported us through college. Once we booked the flight, 4-5 months before the actual trip, he began contacting his old high school and college friends and they began to schedule reunion lunches and dinners. Dad became super excited and started texting us and telling us over meals about all the different old friends we would soon meet. Old stories of his army days in Dan-Shui and how a good friend would send cash when he was broke. We heard stories of successful businessmen as well as men who gambled their money away. We knew the trip was going to be a huge success and an unforgettable experience. Prior to our trip, I narrowed down my Airbnb search to about 50 entries which I had my dad look through. He chose 2 apartments he liked, and then I narrowed it to 1. By a fateful coincidence, once the address was provided by the property manager, it turned out that the apartment was located on the same street and within 2 blocks of the apartment he was born in 65 years ago (as pictured below). Everything was coming together so smoothly as we prepped for this ‘Coming Home’ trip. Once we arrived at the end of October, my sister and I participated in multiple reunion meals with his old friends. Some he hadn’t seen in 20 years, and some he hadn’t seen in over 40 years. The men he reunited with seemed to have had the same personality and gimmicks as they did back when Dad knew them back in the day. 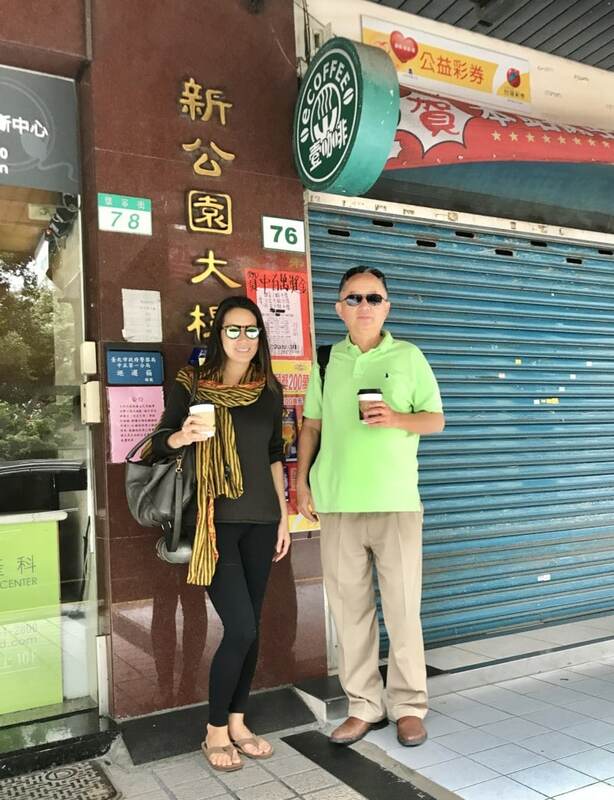 I connected with the popular MyTaiwanTour Company to arrange a tour to Wulai on our first day for a relaxing Natural Hot Springs experience and to meet the Aboriginal People in the Mountainous region. Our guide Joshua Samuel Brown, also a fellow Travel Writer and a seasoned expat of Taipei, found my Dad’s story interesting and asked to conduct an interview on our last day in Taiwan on his Coming Home experience. Below is the interview, reposted from the MyTaiwanTour website. Jacki was traveling with her sister Jocelyn and her father, Benjamin. Though it wasn’t a first trip to Taiwan for any of them, we were particularly intrigued with the father’s story. Benjamin Ueng had left Taiwan in 1980, and this trip back was a homecoming. MyTaiwanTour met with Benjamin for a coffee and a chat at Taipei City’s 228 park. Actually I was born in this neighborhood, in a building right across the street from this park. When I lived here the park was called New Park, but nowadays it’s known as 228 park. I lived in a house across the street until I was six before moving to another neighborhood. After graduating from Tamkang university, I worked for a few years at a bank before leaving Taiwan for Los Angeles in 1980. I was 28 years old. Why did you leave Taiwan? I’d had a couple of friends who’d already moved there, and I wanted something new in my life. A new place. I wanted to see the new world, and to learn new things. Since 1980, I have only returned three times. Well, of course, the high speed rail! And in Taipei there are so many new buildings, especially in the east side of Taipei, in the Da An neighborhood. So many new skyscrapers. But this neighborhood still looks quite the same. Lots more coffee shops. We did not have too many of those in 1980. I’m very surprised at how they changed the park name. This was a community center, a center for the community. When they changed the name to 228 they added I think they added a political element. Personally, I’d have preferred that they had not changed the name. This neighborhood is basically the same. Some of the buildings have been renovated, but everything is recognizable. This park, despite the name change, is really still the same. Over there is the bandshell where my parents would bring me to see performances. Sometimes there would be singers and bands, other times they would have puppet shows (Potehi). Those were all over when I was a kid. People would set up a stage, anywhere where there was space. Everybody loved public shows. Have the Taiwanese people themselves changed? Most people seem to be working harder now than they did when I left. Back then, most people I knew worked for the government. Not too many people I knew worked for private business. As time has gone by, there’s more private businesses, and people seem to work longer hours. But they seem happy. Most of my old friends from university are retired now, but they have happy, stable lives. One of the first places we went together was Wulai (a well-known tribal area close to Taipei) for a hot-spring soak. Did people when you were growing up talk about Taiwan’s aboriginal peoples? When I was growing up, we really didn’t talk about the tribal groups, but that might be because I grew up in Taipei city and most of the tribal groups lived up in the mountains. Were there many westerners in Taiwan when you were growing up? We saw westerners here in 1980, sure, right after the KMT came to Taiwan we had lots of US soldiers. When I was young, I saw lots of US soldiers, but not too many tourists. Nowadays there are a lot more tourists. 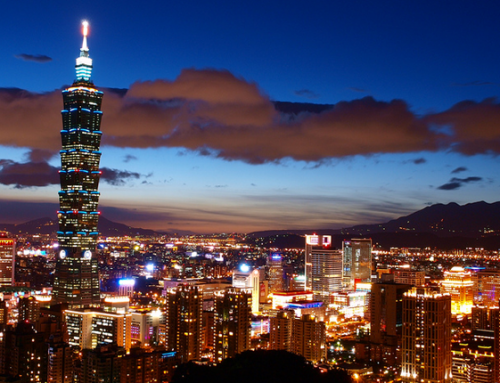 Are you surprised that Taiwan has become so popular among travelers? I’m not surprised about that. 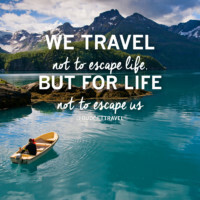 From north to south, we’ve got so many places to visit. Wulai, where we went together, Sun Moon Lake, Alishan, Shitou, Bamboo Mountain, Kenting, where the lighthouse is, the fish market in Pingtung. There are so many places that people would like, from north to south. Had you traveled around Taiwan in your youth? I didn’t really do much traveling around Taiwan when I was young. I went to Taichung and Kaohsiung as a young man, and during my military service I was stationed in Pingtung. These places have changed a lot, too, but just like in Taipei city some areas have changed a lot while others look about the same. What were some of your favorite dishes? Jacki and Jocelyn tried over 20 different kinds of local foods, stuff you can’t get in San Gabriel. 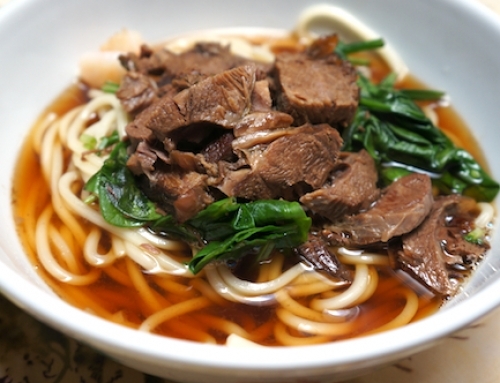 Like Taichung bawan (a kind of meatball), Taiwanese beef noodle, lurou fan, saruo fan, stinky tofu. All really good stuff that’s hard to get back in the states. How did you feel when you saw the house where you grew up? It’s funny, but we booked a place through AirBnB, and when we got to the place I felt the neighborhood was really familiar. It turns out that we were just a few doors down from the home where I was born. There is a restaurant downstairs now, but other than that not much has changed. 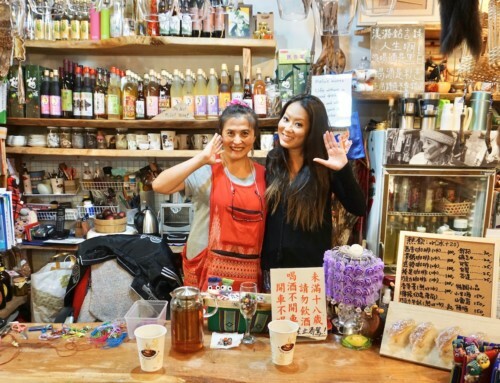 How did it make you feel to experience Taiwan with your daughters? It’s really exciting to bring my daughters to Taiwan. Actually, when we were first planning a trip together, I wanted to go and visit Northern Europe. But my daughters insisted on coming to Taiwan with me. They wanted to meet my friends from high school and college. We really had a good time. Actually, my daughters had both been to Taiwan themselves, but only around the north. So this was the first time that they’d traveled down south and into the central mountains. We took five days, we really had a good time. People are really nice here. I’m really glad I listened to my daughters’ recommendation. I hope they bring their children here one day. MyTaiwanTour would like to thank Benjamin, Jacki & Jocelyn Ueng for being our guests. Follow Jacki online at The Bohemian Vagabond. 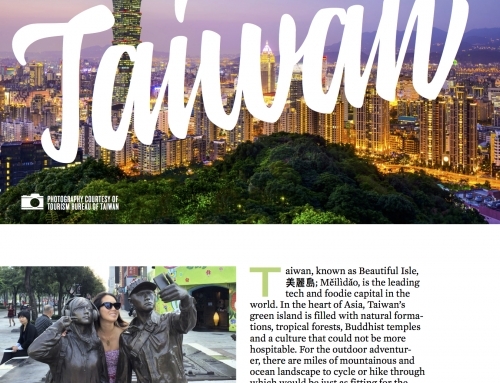 Interested in exploring Taiwan? Let us help you custom design a tour of your own!